The popularity of Gerber's E-Z Out Skeleton knives is indisputable. Because these profoundly versatile clip folders have certainly done their part to help folks fend for themselves. Cutting the things that need cutting. Think of them as all-around knives for everyday life. As the name suggests, they're very easy to open and use. The popularity of Gerber&apos;s E-Z Out Skeleton knives is indisputable. Because these profoundly versatile clip folders have certainly done their part to help folks fend for themselves. Cutting the things that need cutting. Think of them as all-around knives for everyday life. As the name suggests, they&apos;re very easy to open and use. All it takes is one hand to smoothly deploy the stalwart stainless steel blade. 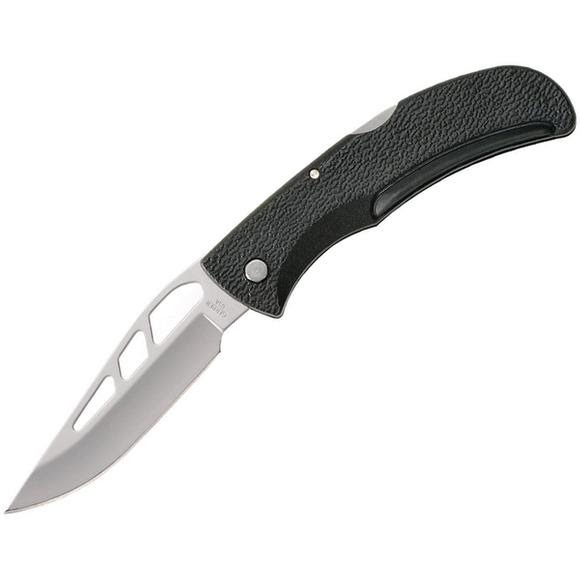 Of particular value to dedicated knife users is the hell-or-high water rugged polycarbonate handle, complete with supple gripping agility of our Softgrip inserts. The combination is a pleasure to hold in your hand. And a pretty slick solution for any task that requires a knife with backbone. This is commonly used as a multi-purpose blade and is preferred for its versatility.